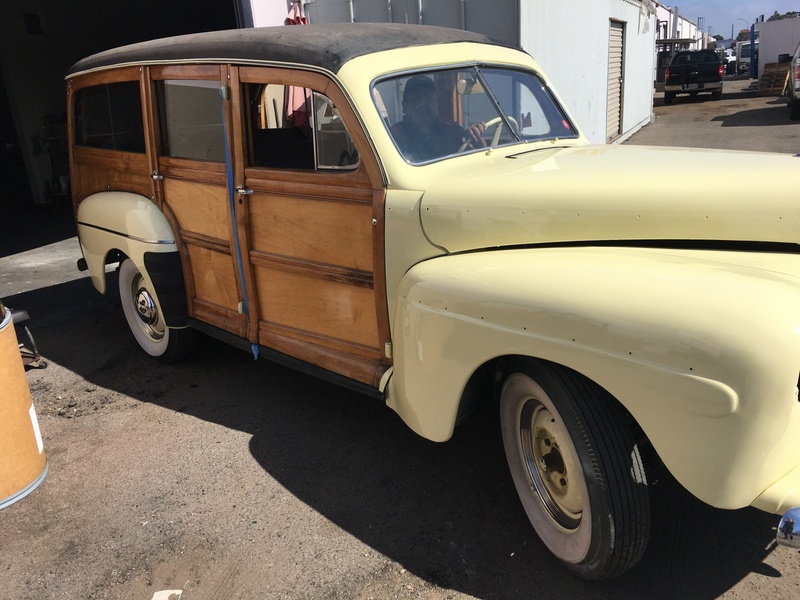 Most Woodie Wagons are either restored and very pricey or rusted and rotted piles good for parts only. 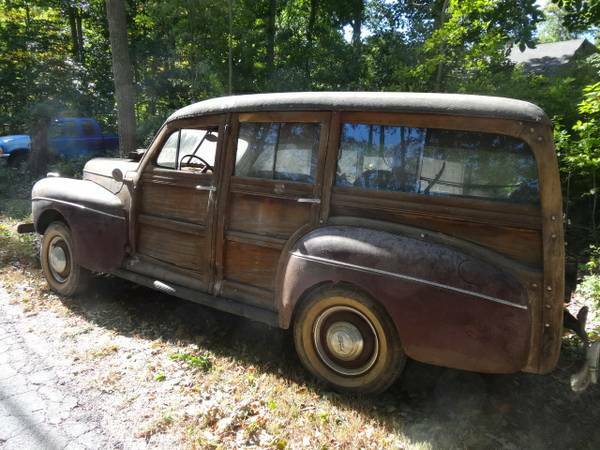 This Ford Woodie is is a rare find in this condition and is listed here on craigslist in Boston for $28,000. Restoration would be a serious undertaking, but it is complete and the wood is said to be good. The upholstery is nice and it has new top material. I wonder how much rust there is underneath. Could this possibly be a driver if you cleaned it up and did the mechanical work necessary to get it running? Do you think the wood could be refinished without disassembly? It would be nice to see this preserved as a survivor and not become a fully restored display in someone’s private collection. I hope this old wagon can be driven and enjoyed! Wow, if the hardwood is useable this would to be that bad to get back on the road. I’d love to have it. ’41 is a great looking and rare woody. 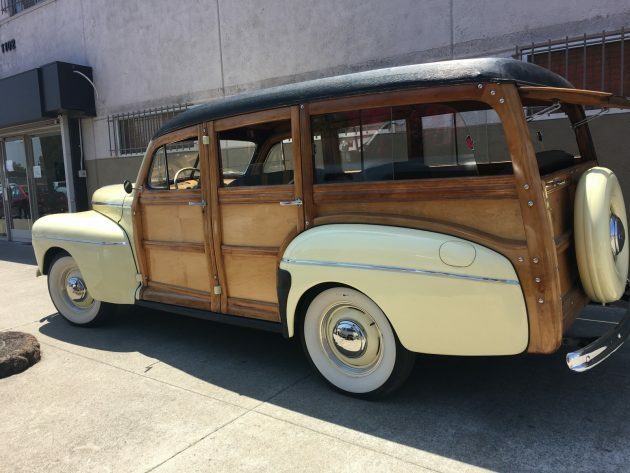 I do not think the new owner after paying that kind of money for this Woodie is going to drive it much. I know I would not. Why take a chance on a true survivor? As you know, the frame must be disassembled to replace those water damaged panels. If the panels are water damaged you are SURE to find problems in the solid wood as well. This problem is the main reason that wood bodied cars died out; that and the horrific injuries from huge splinters in collisions. “horrific injuries from huge splinters in collisions” not a good visual this morning…. “Honey, can you help me with this splinter’? Sure, where is it? Oh my gosh, these tweezers aren’t going to do any good, where are the “vise-grips”? Yes. My father told us kids about this problem at an early age…. We’re talking impalement here and you can fill in the blanks. Ugh. Woodies LOOK so great! All cars were wood framed at one time, some well into the thirties, but I suppose in a collision one was more likely squished than impaled. 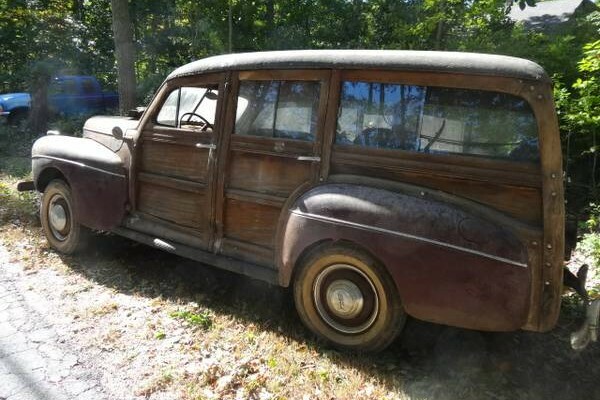 Absolutely love these old woodies, remember as a kid about 7-8 yrs old (in late 50’s) my Father had one of these, used to drive me to school in it, it was just beautiful all the wood and the 3 seats. Agree with what Clay said, clean it up and drive the wheels off of it! 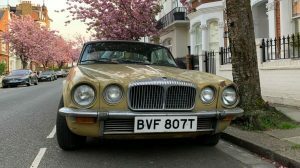 Wish I could afford this, and I hope it will be brought back and driven/enjoyed for many years! 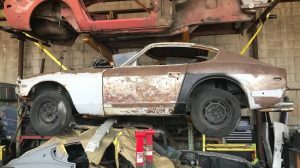 I’m not sure if it will bring $30k+ but it is a cool find. Wood framed is way different than ALL wood. 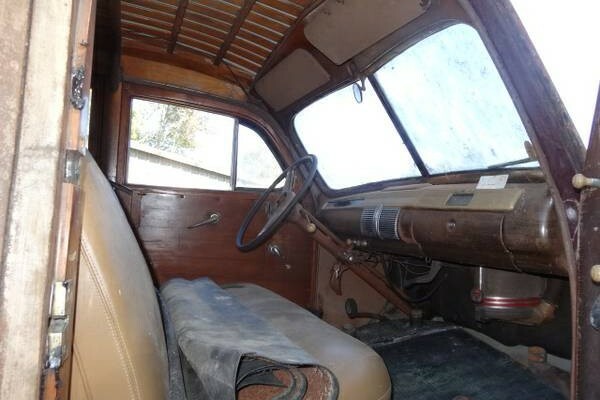 The interior of wood bodied station wagons have exposed Oak or Ash structural members running fore and aft. Because the grain also runs fore and aft, in a rear end collision, and depending on the grain of the wood, the tendency is for the wood to split longitudinally, which creates long, sharp, deadly splinters. 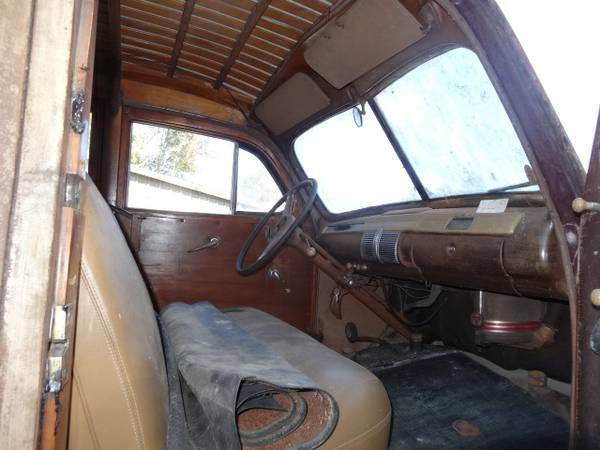 A metal bodied car with interior wooden frame members is far less prone to breaking with long splinters and is also contained by metal and upholstery. I ain’t makin this up! 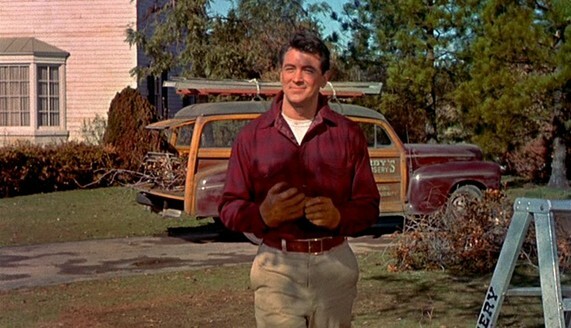 Rock Hudson drove this exact same year Woody in “All That Heaven Allows” 1955. Now I want to see the movie just to get a glimpse of the car! It looks so complete! I wonder what the chassis looks like? All that Heaven Allows is a movie that I have seen at least 1000 times. I put this movie on the DVD every weekend as background comfort food to watch while I am online, or working in my shop in the basement. I really enjoy this movie because of the authenticity of the period, and that classic working Woody as it was meant to be used by those that purchased them back in the day. In brief, this particular movie has a number of really nice cars in it, but the Woody is the best of them IMHO. If it were mine I would attempt an experiment, in a small area at first I would inject apoxy resin into some of the more rotten spot. I have worked with this material before when building a wood and fibre glass side car body for my bike. Apoxy resin is amazing stuff it will seal the wood and give a strength of 13000psi. Anything that runs out is very sand-able when it hardens if this works and believe it will with some effort this cars wood structure could be permanently saved. And if you don’t like the high lustre finish apoxy resin is paint-able and a satin coat could be applied over it. I would Iike to add apoxy drys clear. All of the wood is available as reproduction. 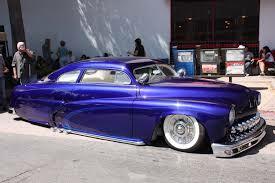 Many street rodders want perfect wood so they replace all or most of it. 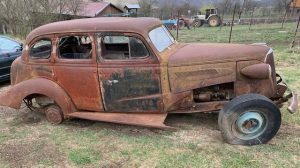 Lots of restorers will accept some of the age and normal wear and tear related flaws and so are happy to buy much of what the rodders discard as less than perfect. I have a friend in Sacramento who has pieced together several this way. I was kind of thinking of the guy that is working with a budget. Anyone who has 28 K to spend on this car is going to bring it back all the way. As a guy on a budget, guys like me don’t buy cars like this. This is not the kind of car you plunk down 28K, cut corners and drive the wheels off of it. This will be a museum piece one day. My opinion only of course. I wish we could keep track of the cars on here and see where they go, and how they turn out. We could keep our eyes on the filthy flippers!! Just kidding. I have nothing against flippers, I just love widows and orphans more. Good on you Randy on the widows and orphans.i to work on a budget. Thank you Mark, we gotta do our part I reckon. I am no angel, but my nose is pointed in the right direction, most of the time. Looks like Rock Hudson, but I don’t see his boyfriend in the picture? Bought it.. and the ’42. They are both really nice. The cars live in the Los Angeles area now. Thanks for letting us know Tony. Please keep us updated on your progress! Congrats Tony. 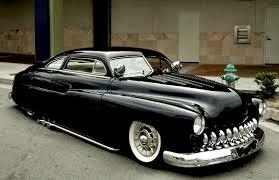 When I win the lottery I will at least know where my first old car on my list will be. I had my eye on that car since I saw it back in 2015. You have to sell it to me if I win the lottery. 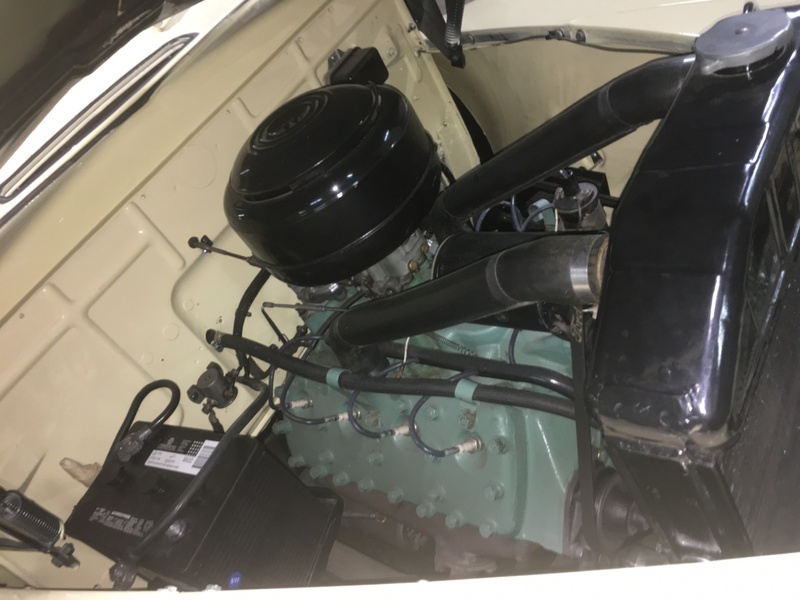 Keeping the ’42 bone stock other than a paint job done 15 years ago in a cream ford color offered that year. It runs and drives. 80k original miles and the wood is Stellar! I think the decimal point needs to be moved one space to the left–at $2800.00 it might be alright, but in my view, $28,000.00 is just nuts.And it’s a 41 which is the least attractive of the post 40 Fords. I would think they would go for 1/2 of a ’40 if both were restored. I couldn’t imagine paying more than ,radiator $2ing more than $1200.00 for it as it sits. The wood kits were $5K 25 years ago, I cannot imagine what they are today. Paint is $10K+; motor,brakes, drive line $10K minimum. 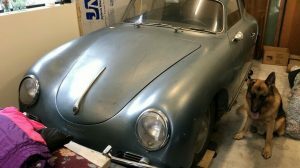 a buyer could easily be in ’41 this $80K + the hours spent and would be lucky to pull $50 restored. 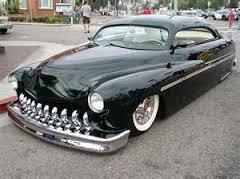 t will still be a ’41, Zounds………….. The Woodies sell for big money in Calif. I bought the car.. and the 42. 43 is almost done. The Woodies sell for big money in Calif. I bought the car.. and the 42. 42 is almost done. Are you nuts? It’s worth $6K. I agree that it might not bring that much because the ’41 is the least desirable of the years. I am still trying to get myself to like that particular year Ford. They look bulbous and out of proportion to me. Do you have one of these in the same shape as shown? I will buy it today. Please let me know ASAP as I would really like to come and get it. Do you have one of these in the same shape as shown? I will buy it today for 6500.00. Please let me know ASAP as I would really like to come and get it. Just thought you guys might like to see it finished. Beautiful, Tony!!!! Thanks for sharing!!!! Ultra cool, Tony. You get points for this in my book. I love how fast you accomplished the task. You are a serious collector, and I think you have done something quite noticeable collector wise & restoration wise. This is a very tastefully done restoration that I like very much. That car could not have gone to a better restorer IMHO.